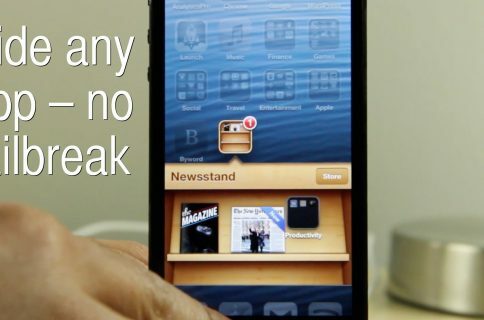 A new non-jailbreak tweak was recently revealed to us via email, and it involves the ability to place and launch an unlimited amount of apps from the Newsstand folder on iOS 6. Yes, it works perfectly fine with the iPhone 5. First sent to us by reader, Pim Oomen, the trick involves a little bit of timing and practice. The end result is an infinite scrollable folder that may contain as many apps as you can throw into it. The nice thing about this trick is that it doesn’t rely on any external websites or apps in order to make it work. Take a look at our step-by-step video walkthrough inside to see how easy it is. Step 1: Place the Newsstand folder anywhere on the second page of the Home screen. 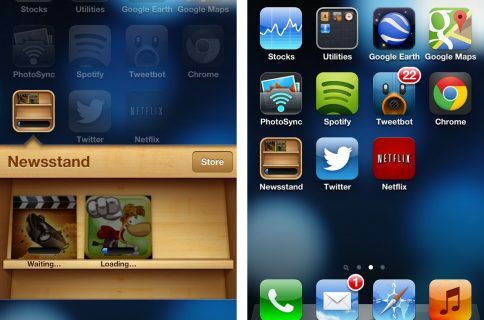 Step 2: Place the apps that you would like to move into the Newsstand folder on the third page of the Home screen. Step 3: Swipe to the third page of the Home screen containing the apps that you would like to move. Step 4: Press the Home button once, and then immediately tap and hold on the app that you wish to move. Step 5: Continue holding on the screen until the Home screen moves to the first page due to your press of the Home button. Step 7: If the trick worked correctly, then you should see wiggle mode enabled. Step 8: Tap on the Newsstand folder to open it, and then press the Home button once to close it. 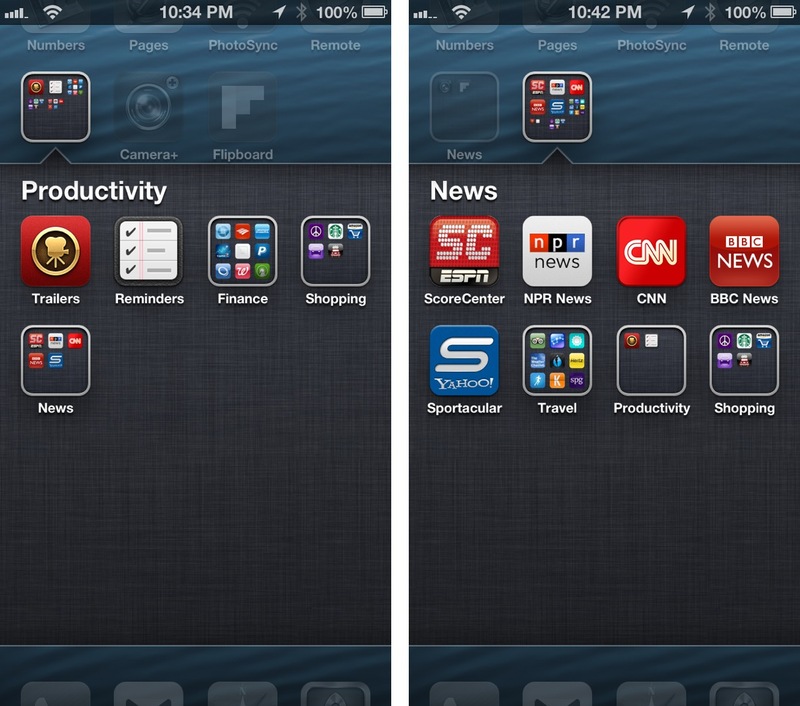 Step 9: You should see the app that you tapped and held on in Step 4 move into the Newsstand folder. If wiggle mode did not enable when you performed step 7, then the trick was unsuccessful, so try again. It does take a little bit of practice to get this down correctly, so keep trying. Bear in mind that you don’t need to be lightning fast in order to do this, just do it exactly as explained in the tutorial and on the video. Most likely, you will run into trouble on step 4. Be sure to tap and continue to hold on the app right after you press the Home button. The Home screen will switch to the first page as you tap and hold on the app. That is perfectly fine. You also have to make sure that once the screen switches to the first page, that you immediately swipe back over to the second page containing the Newsstand folder. You do need to be very quick on this part or else the trick will fail. As I stated, you can continue to do this as many times as necessary. There is no limit to the amount of app icons that you can place into the folder. 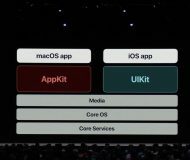 One of the nice things about this trick is, unlike similar solutions in the past, you can still launch the apps contained within the Newsstand folder just like you normally would. The only downside to this trick that I’ve found thus far, is that rebooting your iPhone will remove all of the apps from the Newsstand folder, forcing you to repeat the process all over again. You also cannot remove the items from the Newsstand folder without rebooting, so choose wisely. Again, special thanks to our viewer and reader Pim Oomen for the heads up. Note: as you can see from the screenshot above, this also works with folders in folders, but I can’t recommend it. Placing a folder in a folder, and then trying to open any of the folders within a folder results in an immediate Springboard crash. If you do this, and you want to open a folder, first remove the folder from the folder.